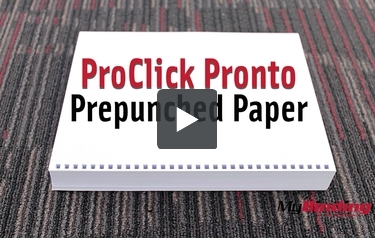 Enhance productivity and reduce system wear by using this high-quality 28lb 3:1 ProClick Pronto Pre-Punched Binding Paper. Our 28lb 3:1 ProClick Pronto Pre-Punched Binding Paper is ideal for large jobs that need to be finished quickly. This binding paper is punched just a few sheets at a time in order to ensure that the sheets won't stick together and will freely run through your photocopier or printer.